A rockfall warning continued early Saturday along a roughly 10-mile section of the Seward Highway just south of Anchorage as officials remained wary of aftershocks triggering rock slides. The area, between Mileposts 104 and 114, has been the site of at least two close calls related to the 7.0 magnitude quake on Nov. 30, including a boulder that slammed into a semi truck during the quake, nearly killing a man, and rocks that rained down near a woman during an aftershock days later. McCarthy said ongoing rockfall continued on Friday. As of Saturday morning, there had not been reports of a “significant slide.” The warning has been in place since the quake. “The ditches are getting fairly full,” with rocks pushed there by road crews, she said. Rainfall in the area Saturday added to the dangers of more rock slides, McCarthy said. A woman collecting water from the cliff-side water pipe at Milepost 109 was nearly struck by cascading rocks earlier in the week, during a large aftershock, McCarthy said. Commercial truck driver Craig Maddex said he was hauling materials back from Kenai when rocks began thudding onto his tractor and trailers during the quake around Milepost 111, near the parking lot for the McHugh Creek recreational area. 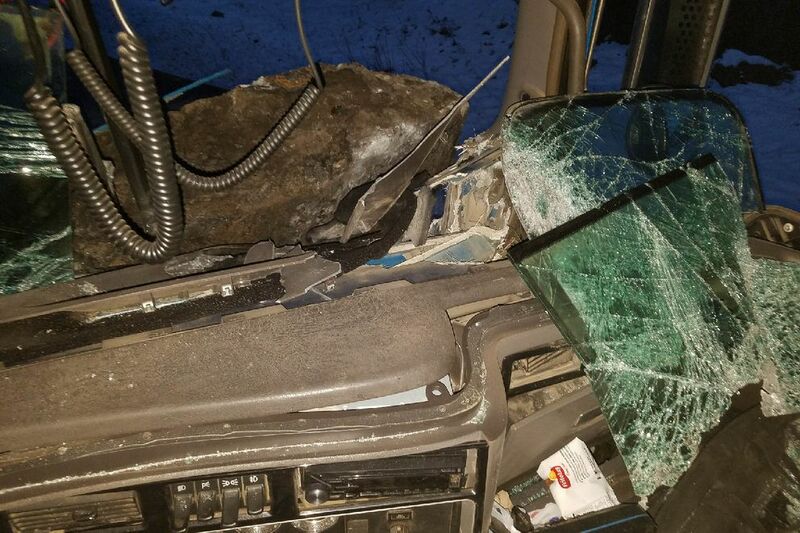 He soon drove through a shower of large rocks that “exploded” his windows and cut off power to the truck, forcing him to stop without power steering. 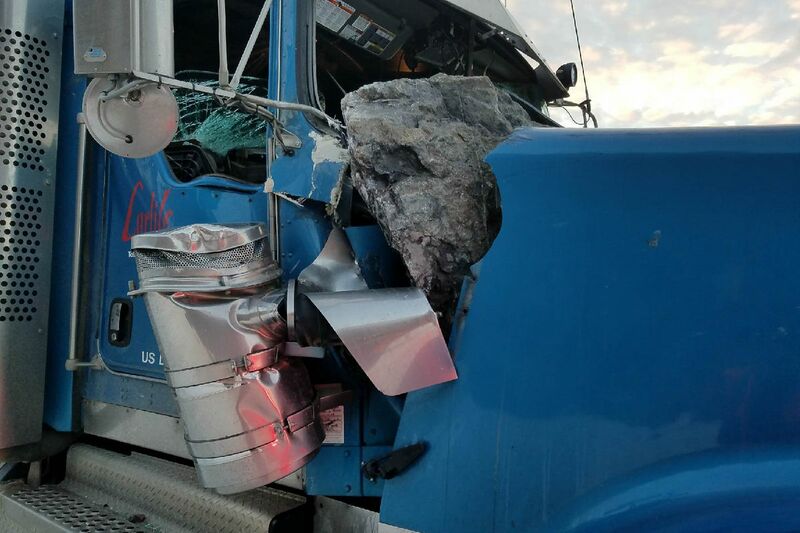 A boulder the size of a recliner sliced through his hood and into his engine, capping the damage and totaling the vehicle. The impact shoved the dashboard against the steering wheel, cutting his knuckles slightly, his only injuries, he said. He didn’t know at the time an earthquake had struck. “I definitely had some angel looking over me, or some relative in heaven, another second and I wouldn’t still be here,” said Maddex, who said he plans to use the recovered boulder as landscaping outside his Eagle River home. McCarthy said DOT geologists are reviewing the area. Their assessment could lead to recommendations for future roadside work to reduce the risk of rock slides, she said.